It was almost a mantra and used by every candidate for the first City Council election – although I believe the phrase was the creation of John Heilman. Nevertheless, it summed up in a way our naiveté and our hopes as the new city of West Hollywood took shape. The phrase was: “A walkable city, an urban village.” Time and the weight of change has put the phrase on the shelf. Thirty-five years later few can recall that we once had such a design for West Hollywood, let alone a slogan. But concerns for pedestrians remain – more so every day. Being on foot in West Hollywood — a pedestrian — is not for the faint of heart. In spite of the establishment of well-marked (not all) crosswalks in many locations, which require vehicle operators to observe and stop when they are occupied by a pedestrian, they actually seem to be the very places where pedestrians are most likely to be injured or killed. There are a number of reasons for this odd turn of events, and they range from driver distraction, excessive vehicle speed, pedestrian lack of common sense and misjudging conditions for a proper crossing. Driver distraction is especially important as a cause of pedestrian / automobile collisions. Anyone simply watching traffic go by can attest to the fact that many drivers seem to be texting or otherwise using their hand held phones. Even those with a Bluetooth connection can be distracted. Years ago, when I was conducting car safety classes for the National Safety Council, I was instructed by the Highway Patrol that nearly 20% of all drivers were distracted by either legal or illegal drugs, anxiety, anger or other emotional distress. Add now cell phones. But, there’s a lot more to consider than crosswalks. For a long time, pedestrian traffic was not at a high level in West Hollywood except on the more commercial streets. Now, more residents are out for exercise or dog walks or strolling with children, and daytime commercial residents park on the side streets from which they walk to their jobs. Certainly not hordes of people, but there’s more of a steady stream on foot. The city’s survey of vehicular traffic on Westside streets indicates that most of the vehicles travelling through West Hollywood are commuters, often directed to side streets by WAZE or some other transit app. They are not particularly concerned with rules regarding speed, stop and regulatory signs, bicycles or people on foot wishing to cross the street. A mixture of conditions ripe for trouble. Cars Are Now the Master, We Are the Serfs…. We are not alone with our growing pedestrian safety and access problems. Every city of note in the industrialized world is having the same problems related to increased growth and car ownership. For too long traffic engineers have been obsessed with ‘level of service’ (LOS) designs for our city streets. “Level of service” means that cars must be kept moving come hell or high water – or residents’ complaints. But, current urban designers are wising up and expanding designs to accommodate other modes of city travel: walking, cycling, plentiful public transit. The Journal of Urban Design notes that the idea of LOS impediments – such as pedestrians and the newer transit modes – is being rethought. The city of Denver is in the process of spending to increase and improve sidewalks and to ”bring frequent public transit within a quarter miles of most residents.” Some European cities, Oslo, Madrid, Paris, even those with very good public transit, are banning cars from core areas and increasing access to pedestrians, bikes and scooters. Think about what that means in terms of public health if fewer polluting vehicles not only reduces the flow of small particle air pollution but also frees up parking spaces, an average of 350 square feet. Some parts of the world are changing faster than others by adopting such measures as banning vehicles from certain areas. Cities continue to require affordable housing, and if more of that necessity is built, in conjunction with good transit, residents will not need to own cars, thus freeing up money for other purposes. Consider how many acres of land are used for downtown parking lots and for parking garages. By one estimate just the open-air lots in central Los Angeles command as much area as Manhattan (part of New York City). Minneapolis is hard at work implementing a voter-approved measure to revamp its building codes in residential areas to allow duplex and triplex houses on single-family lots. In what I believe is an incorrect measure (LOS! ), the City of Los Angeles has increased allowable speeds on quite a number of streets. This will mean more difficulty for pedestrians wishing to cross intersections. Perhaps we’ll see more cars crashing into buildings or jumping curbs to strike pedestrians and an increase in the already ridiculous number of fatal hit and run accidents at crosswalks. An additional impact of more pedestrians is the possible reduction of street crime. In the Park Labrea News of January 24, 2019, publication of its Police Blotter, I noted seven assaults by “unknown persons” at all hours and many places throughout the city. Surely, this sort of criminal activity is a deterrent to strolling, walking dogs and children and should happen far less with more people on the streets. The city has gone to much expense to tackle the problems of the huge numbers of vehicles that pass through the city each day. Since I get out seldom, it was only two days ago that I saw the extraordinary measures (lines of traffic cones, a flashing sign and two enforcement cars) taken to prevent cars from turning left off San Vicente and into Rosewood to avoid traffic lights and intersections on Beverly. My block, about 150 meters long, sees (according to the city survey) something like 700 vehicles a day – combined east/west travel. If cars are not stopped – gridlock – as far as the end of the street, they are speeding well above the limit allowed. It is futile to call Code Enforcement or the Sheriff because neither will act if they do not witness the event. Of the traffic-calming devices I have seen, only the roundabouts are worth the expense. Alternate cul de sacs? No left turn signs? Right turn only signs? Speed humps ? Let’s get original and make crossing the street less of an adventure. “It is a highly efficient means of transit, as well as one of the great under-rated pleasures in life. “ That’s the lead sentence in a recent New York Times article about pedestrian life in that city. The examples of cities taking back the streets for pedestrians come from cities that have large metropolitan areas that they pretty much control. Los Angeles, as Woody Allen once commented, “is like a piece of lace,” a barely regulated conglomeration of cities, towns and unincorporated districts. If the City of Los Angeles changes the urban rules for cars, the entire county will be affected. Right now, the Los Angeles Police Department Chief Michael Moore has introduced a Pedestrian Safety Initiative. He stated at the presentation conference for the program that pedestrians accounted for 107 of the 200 traffic fatalities in the city. Instead of citing violators of crossing rules, such as jaywalking, they will be given a reflective vest and an LED light for visibility. (Famers Insurance donated these items) If it seems wrong to some people to reward bad behavior, consider the alternatives. Can West Hollywood add to its “Tips for Pedestrians” something similar as a Pedestrian Safety Initiative? At least, the city can start to monitor the results of L.A.’s program and come up with a program of its own. Furthermore, Los Angeles County should be looking deeply into pedestrian safety and providing funds to smaller municipalities to help them adopt pedestrian safety initiatives of their own. So, whatever happens in the City of Los Angeles affects every other jurisdiction in the county. But we cannot wait for the Los Angeles County’s process to snail pace the way to an answer. Our pending City Council election has brought out 11 candidates for three seats. Somewhere in that group should be a person with a platform that contains a major concern for pedestrian safety in West Hollywood. This issue is also one that affects traffic, use of space, public safety, zoning and just how pleasant we want West Hollywood to be as our home. Some common sense walkability measures should be used in the business districts. Often, sidewalk cafes and bus stop signage take up way too much space – making it difficult for those with disabilities to have a clear straight path. State law dictates that speed limits be related to the natural flow of traffic. It wasn’t LA’s choice to determine which speed limits are appropriate. As others point out, enforcement will go a long way to improving the quality pedestrian experience. With a horizontally shaped city with 3 east/west thoroughfares, a road diet on Fountain is not an option. Smart traffic measures would help a good deal. Finally, the photo with the caption “Santa Monica Blvd traffic” is not either the boulevard nor in the city of West Hollywood. LA and the other cities in the county can get around that state law by redesigning streets to make the natural flow of traffic be a lower speed. This has the double benefit of actually getting drivers to go slower, unlike simply posting a lower speed limit, which is pretty much worthless. Thereby frustrating drivers, and prompting them to speed in places where they shouldn’t to make up for the lost time of busibodies playing public policy engineer. Didn’t Carlton also talk about excess stress adding to driver distraction? The pace of traffic should be what is reasonable for the thoroughfare should bear, and should optimally be a consensus between city engineers, drivers, the disabled, and pedestrians, with no one with their thumb on the scale. It must be nice to live in a world where you have no need to go anywhere except where public transportation goes. Some of us like to get out of the city and travel. That’s why we have cars. They’re also convenient for transportation to and from places where there’s little convenient public transportation. It will be nice when we have a link to Metro. Buses are not an option. The reasonable assumption that 1.9 square miles would translate into a walkable city has failed. It has progressively become an atmosphere of entitled drivers and pedestrians, substandard sidewalks in many areas and a veritable minefield of dogs, dog waste, humans sleeping or raging accompanied by their waste. Add to that untended construction sites and tourists must wonder where they have landed. We have no indication of their reaction or likely return visits. Visit Weho and Chamber of Commerce also have a heavy responsibility here. There is no enjoyment of the streets or boulevards as one experiences in communities around the country and world. As Carl pointed out in the supposedly hip and happening Design District of Robertson & Melrose it too has its perils. Weho could be a clean and tidy city which is the responsibility of property owners and the city layered by a more aware and less impetuous public. This should not require years of consultants, studies an over-discussing a very obvious problem. We need practical steps, neighborhood by neighborhood to make visible improvements. I agree with the commenters Randy and Alan Strasburg. Situational awareness is needed at all times when walking in West Hollywood or anywhere for that matter.I visit the city from time to time and either walk or take public transit when doing stuff. You need to be ready to sidestep a problem at a moment’s notice or just huff at a bicyclist on the sidewalk. Maybe West Hollywood is not a “quaint village” anymore,but it is a lively city to visit.It definitely is not Downey. Keep your wits about you and you will be fine. I, too, have lived on the edge of WeHo since 1974 and seen the increase in traffic & the desperation of drivers trapped in traffic. I have no car and walk (or bike) all over WeHo for all my business. It is a challenge. Norton and Lexington with their traffic circles are relatively calm and pleasant. Fountain is deadly. Fountain has seen no improvements in the last 40 years. Sidewalks are very narrow and with overgrown hedges mean you have to walk a tightrope not to end up in the street with cars raging by right at the curb. I was on the Bicycle committee in 1984 when against my protests, Fountain was made a”bike route” Fountain needs “traffic calming” Just to get to the market, I have to cross what feels like a raging river with no bridge, just boulders to hop. Everyday I have to use Fountain and as I get older and less nimble, it is harder and more anxiety-producing. A dedicated bike lane for bikes and scooters could make a huge difference. Some parking spaces would be eliminated, but maybe some traffic would be eliminated, too, when people feel more safe on the road. 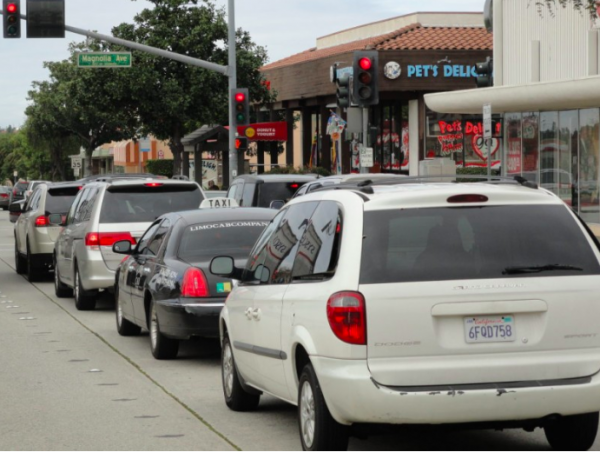 Walking Santa Monica Boulevard is horrible because …….. of the vagrants! duh!– dirty, pestering, crazed, psychocits and drug addicts. Dangerous! And now the city is spending a million for the vagrant park. One vagrant attacked a friend of mine right at the intersection of San Vicente and Santa Monica Blvd. Put the cops on foot. Like they do in real cities. Policing here is a nightmare. I don’t trust them. Also, I notice a sort of continuous drone of dissapointment about Weho not being the “gay charming village” that some people feel it never turned out to be or has moved on from. Like its supposed to be a gay heaven on earth. This is LA. Take your complaints back to the corrupt zoning boards who ruined the city in the previous century. It is what it is. It’s just not that great. Sorry. To me, the solution is all about enforcement of existing laws. Regarding distracted drivers; aggressively ticket drivers who are texting, talking on their phone, fooling with their dash displays, etc.. and also drivers gridlocking intersections, pedestrians: ticket jaywalkers and scooter and bike riders breaking the law. My guess is that after 2 or 3 months of aggressive ticketing and drivers/pedestrians paying large fines, you’ll see drivers and pedestrians obeying the laws. Uptick in violations? Roll out the ticketing force. You can make all the laws and rules you want, but if they are not enforced and there is no consequence for breaking them, they are useless. I’ve been beating this drum for so, so long. We have a Sheriff’s department. We have officers on bicycles. If I notice people doing the things you speak of, once every few minutes as I stroll down SMB, why can’t they? Or when I’m sitting outside of Starbucks. The tickets would pay their salaries, in a heartbeat. I just don’t get it. Is it because nobody wants that beat? Are they afraid that West Hollywood might gain a reputation for being a place that hands out lots of tickets? If it is the latter, that shouldn’t be a fear, as we have laws for a reason, and they just are not being enforced enough. I’d be happy, and feel safer, to live in a community that actually enforces its laws. The police should ticket motorists for a whole raft of bad behavior that endangers pedestrians — running red lights, turning through a crosswalk with pedestrians in or entering it, blocking the sidewalk while waiting in a driveway for cross traffic to stop, failing to yield at non-signalized crosswalks (e.g. at Norton and Crescent Heights). It’s important to recognize the power dynamic. Motorists are operating a 2000 lb machine at significant speeds. Being hit by a motor vehicle is clear and present danger to pedestrian safety. Pedestrians are not a threat to motorists, and neither are bicyclists or electric scooter riders. The police need to target enforcement to what the actual threat is. Ticketing jaywalkers and scooter riders is a good use of their resources. 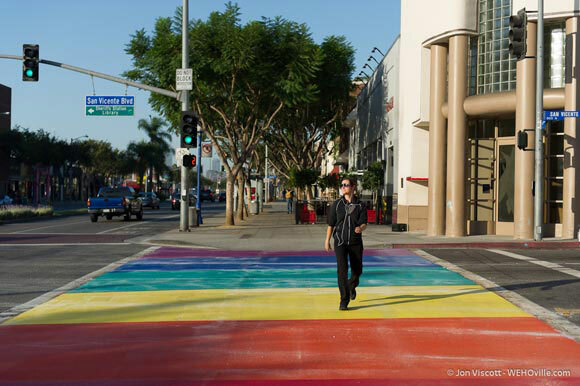 Good or bad, Weho is very walkable, it’s not a fable, but you do have to pay attention. Indeed, I’ve lived here for 20 years. I think everyone is more distracted than ever. That includes drivers, and pedestrians. I’m not sure what else the city is supposed to do to make this a more walkable place. I feel like they’ve done enough. And they fixed those crosswalks. People still have to pay attention, whether they are walking or driving. If you want a walkable “village”, create one. WEHO is basically a sprawling suburb, nowhere near a “quaint village” and you have to drive to get anywhere. The bars are not reminiscent of a “village” environment and neither are the streets. Take Chicago, Boston, New York and Europe as an example. Those are “villages”. Create it and they will walk. How do you propose they do that? Tear down apartment buildings? The city is what it is. I consider it a village. I can get by without a car here. For almost everything I need. No, it’s not as compact as New York, or San Francisco, but that’s not going to change, unless we tear the entire city down and start over. Meanwhile, I enjoy all the things that we have here, and the density of our city. One of the most walkable places in Southern California. As with all things involving community and shared spaces, we all must practice situational awareness. I am frequent/daily pedestrian and have to read the intention of others around me, including other pedestrians, cyclists, dogs, electric scooters (*#&#) and drivers. 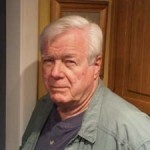 All share some culpability here, and all exhibit those imperious attitudes of entitlement. There’s no single root cause, but the distractions of walking/cycling/driving/scootering/dog walking while texting/talking/grindring are clearly on the top of the list. There are many causes listed here, but the biggest is our culture of entitlement. Weho, and LA at large, is full of entitled ninnies who cross the street, mid-block, because walking to the nearest intersection is inconvenient, or step off the curb with an imperious assumption everyone will stop for them. Drivers drift into other lanes because they’re texting, pull illegal u-turns anywhere they feel like it, and are busy looking at god knows what, instead of the road. If only cops or whomever would start ticketing people, we could end our culture of idiocy. Thank you, Awesome Weho. Yes, distracted drivers are an issue…but what about distracted pedestrians? I have seen people looking at their phones trying to cross against the light or even jaywalking while texting. We already devote approximately 70% of the public right of way to motor vehicles. It is entirely inaccurate to say that pedestrian behavior is the issue here. I would personally like to see *more* jaywalking since it would indicate the ferocity of vehicle traffic is less threatening to people. If you visit a denser, more pedestrian-friendly city like New York or Boston you will find dramatically more jaywalking than you do in LA, where it, in real terms, quite rare. The city centers of many European cities are partially or fully closed to vehicular traffic because it’s not an efficient use of space. The real problem is that the LA region in general has an insane level of devotion to cars and we’ll sacrifice almost anything to make it easy to drive and park. I don’t need to visit NYC or Boston because I’ve lived in NYC, and worked in Boston. The people there are much more pedestrian-savvy and know how, when, and where to cross a street. You’d also get an earful and the boot if you brought your dog into a grocery store.